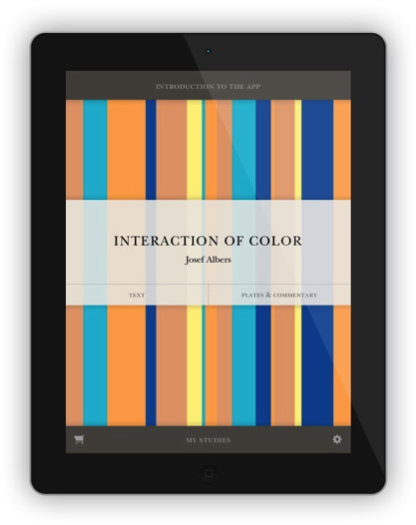 Interaction of Color by Josef Albers (App for iPad), published by Yale University Press in 2013, was awarded the 35th Annual George Wittenborn Memorial Book Award at the Society's annual conference held in Washington, D.C., May 1-5, 2014. Established in 1980 to honor the memory of premier New York City art book dealer and publisher George Wittenborn, the award is given each year to North American art publications which represent the highest standards of content, documentation, layout and format in art publishing. Interaction of Color was created by Josef Albers fifty years ago as a classroom teaching tool and it continues to be used in color courses. This app provides a new way explore color and Josef Albers’ ideas. The Wittenborn Award Committee members described this publication as ‘transformational,’ an excellent model for present-day art publishing that takes advantage of interactive media. The archival and documentary videos serve to explicate the artist's ideas and place the original publication in a scholarly context. In addition, the format appropriately and aptly builds on the Interaction of Color’s teaching mission, bringing it to a contemporary audience. The members of the 2013 Annual George Wittenborn Memorial Book Award Committee are Janine Henri, UCLA (chair); Leslie Abrams, University of California at San Diego; Laurel Bliss, San Diego State University; Lisa Schattman, Design Institute of San Diego; and Ruth Wallach, University of Southern California.